Starring Boris Karloff, Colin Clive, Mae Clarke, Lionel Belmore, Dwight Frye, John Boles and Edward van Sloane. Produced by Carl Laemmle Jnr. Script by Garrett Fort, Robert Florey and Francis Edward Faragoh. Directed by James Whale for Universal Pictures, released in 1932. "Frankenstein" has just been completed at Universal City. Its weird sets are being torn down, its cast dispersed and the footage is being cut to the proper proportions for theatre exhibition. For years motion picture companies steered discretely away from horrors. But when "Dracula" proved popular last year the same company decided to make two this season. The first is "Frankenstein," the second Edgar Allan Poe's "Murders in the Rue Morgue." Though the word Frankenstein is familiar to almost every one, it is surprising how many persons are confused as to its exact meaning. It is a popular error that Frankenstein himself was the monster. Frankenstein was a doctor, the hero of the novel by that name, written by Mary Wollstonecroft Shelley. She was the wife of the poet Shelley, and this made its appearance in 1818. It has been published in almost every language in periodic editions since. In Mrs. Shelley's story, Dr. Frankenstein was a medical student who fashioned a human-looking monster from materials collected from graveyards, gibbets and dissecting rooms. The dictionary says that this creature, "being rendered furious by cravings, unappeased, commits numerous atrocities and finally slays its maker." The story was set by Mrs. Shelley in the Tyrolean Alps. The picture setting is also the same, but the characters and the times have been brought strictly up to date. In order to do this, it was necessary to purchase the dramatic version which is now being used by John Balderston and his company in London and the provinces--a version which Mr. Balderston himself wrote with Peggy Webling. The action, the costumes, the ideas and accessories of this play are all modern. The building of the settings which were to create the eerie atmosphere that was required was entrusted to Herman Rosse, who went to Universal City to build the settings for "The King of Jazz" and who also showed his versatility by constructing the sets for "Dracula." Since Dr. Frankenstein brings his creature to life by galvanic energy and by electricity, a lot of ingenuity was expended on building various electrical appliances and machinery, none of which, of course, had any practical value, but which the engineers of Universal City have made capable of terrifying operations--on the screen. But the great thrill of "Frankenstein" is, naturally, this nameless monster. Noris Karloff, who plays the awful creature, wears forty-eight pounds of extra material. Although he is 6 feet 1, James Whale, the director, wanted him to look much bigger and stockier. Three hours are required to put on the make-up. "I am sending you herewith copy of the script Frankenstein. "It is a grand part and I think will fit you as well as Stanhope. I think the cast will be old Frederick Kerr as you father, Baron Frankenstein; John Boles as Victor, Bela Lugosi or Boris Karloff as the Monster, Dwight Frye as the Dwarf, Van Sloan as Dr. Waldman, and I am making a test of Mae Clarke as Elizabeth. Although it is largely an English cast, I do not want too much English accent about it, so in studying the part please keep this in mind. Of course I do not want an American accent, but it is well to talk to as many Americans as you can to get that looseness, instead of what Americans think of as English tightness, in speech. Do not let this worry you, it is merely a note. "I see Frankenstein as an intensely sane person, at times rather fanatical and in one or two scenes a little hysterical, and a little reminiscent of the break-down in 'Journey's End.' Similarly to Stanhope, Frankenstein's nerves are all to pieces. He is a very strong, extremely dominant personality, sometimes quite strange and queer, sometimes very soft, sympathetic and decidedly romantic. He ates causeing anxiety to Elizabeth and his father, but his passionate zeal and his invention forced him to do so. He is pulled two ways--his love for Elizabeth and his almost insane passion for his experiments. In the first scene in his laboratory he becomes very conscious of the theatrical drama and goes a little insane about it. All the time one should feel that Frankenstein is normally and extremely intelligent, a sane and lovable person, never unsympathetic, even to the monster. Out of John L. Balderston's stage conception of the Mary Shelley classic, "Frankenstein", James Whale, Producer of "Journey's End" as a play and a film, has wrought a stirring grand-guignol type of picture, one that aroused so much excitement at the Mayfair yesterday that many in the audience laughed to cover their true feelings. It is an artistically conceived work in which Colin Clive, the Captain Stanhope of the London stage production of the R. C. Sherrif play, was brought from England to act the role of Frankenstein, the man that fashions a monster that walks and thinks. It is naturally a morbid, gruesome affair, but it is something to keep the spectator awake, for during its most spine-chilling periods it exacts attention. 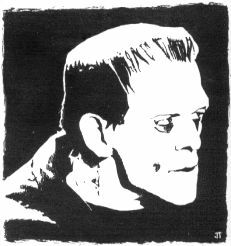 It was Carl Laemmle, head of Universal, the firm responsible for this current picture, who presented Lon Chaney in "The Hunchback of Notre Dame," and while, as everybody knows, Quasimodo was a repellent sight, he was a creature of sympathy compared to the hideous monster in this "Frankenstein." Boris Karloff undertakes the Frankenstein creature and his make-up can be said to suit anybody's demands. He does not portray a robot but a monster made out of human bodies, and the reason given here for his murderous onslaughts is that Frankenstein's Man Friday stole an abnormal brain after he had broken the glass bowl containing the normal one. This Frankenstein does not know. No matter what one might say about the melodramatic ideas here, there is no denying that it is far and away the most effective thing of its kind. Beside it "Dracula" is tame and, incidentally, "Dracula" was produced by the same firm, which is also to issue in film form Poe's "Murders in the Rue Morgue." There are scenes in Frankenstein's lboratory in an old windmill, somewhere in Germany, where, during a severe electric storm, the young scientist finally perceives life showing in the object on an operating table. It is not long after that the monster walks, uttering a sound like the mooing of a cow. And then ensues the idea that while Frankenstein is proud of the creature he has made and boasts loudly about his achievement, he soon has reason to fear the brute, and in course of time it attacks Frankenstein's faithful servant, a bowed and bent little man, and kills him. The scenes swing here and there to the Baron Frankenstein's father, efficiently acted by Frederick Kerr, to those of a friend named Victor, played by John Boles, and to Elizabeth, Frankenstein's fiancee, portrayed by Mae Clarke. This is a relief, but they are all anxious about what Frankenstein is doing. They learn at the psychological moment, and have then still greater anxiety for Frankenstein. Imagine the monster, with black eyes, heavy eyelids, a square head, huge feet that are covered with matting, long arms protruding from the sleeves of a coat, walking like an automaton, and then think of the fear in a village, and especially of the scientist, when it is learned that the monster has escaped from the windmill. It is beheld parading through the woods, sitting down playing with a little girl, and finally being pursued by a mob with flaming torches, for apparently fire is the only thing that causes the monster to hesitate. The sounds of the cries of the pursuers and the strange noises made by the monster add to the disturbing nature of the scenes, and in a penultimate episode there is the struggle between the monster and Frankenstein. As a concession to the motion picture audience, Frankenstein is not killed, but he is badly injured. Two endings were made for this production, and at the eleventh hour it was decided to put in the one where Frakenstein lives, because it was explained that sympathy is elicited for the younf scientist and that the spectators would leave disappointed if the author's last chapter was adhered to. As for the monster, he is burned where the villages set fire to the windmill. From the screen comes the sound of the crackling of blazing woodwork, the he and cry of the frightened populace and the queer sounds of the dying monster. Mr. Clive adds another fine performance to his list. He succeeds in impressing upon one the earnestness and also the sanity of the scientist, in spite of Frankenstein's gruesome exploits. Lionel Belmore gives an easy performance as the town burgomaster. Miss Clarke, Edward Van Sloan and Dwight Frye also serve well. A number of new films are being shown in london this week, but the only British production of importance is Money for Nothing at the Regal, in which Mr. Seymour Hicks and Miss Betty Stockfield are playing the leading parts. At the Tivoli, the American film Frankenstein is being shown, and the management announce in their advertisements that in their opinion this film is not fit for children. Frankenstein -- There is good sensationalism and there is also good art in Mrs. Shelley's "shocker", qualities rarely found in combination, but Mr. James Whale has made no serious effort to reproduce them. He was attracted to the tale, one would say, because it gave him the chance to give the impossible an air of plausibility. His preperations for the scientific miracle are elaborate. He shows Frankenstein and a misshapen assistant collecting fragments which are to be assembled into the shape of a man ; introduces Wellsian conjectures about the properties of lightning and the ultra-violet ray ; and into the scene of the student producing life by galvanic electricity puts all his inventive energy. It is an ingenious and a striking scene. Thudner rolls about the old windmill, complicated machines, humming and whirring, glow with strange lights, the few aghast spectators hold their breath, the Shape on the operating table slowly rises through an opening in the roof to become the lightning's focal-point and sinks to earth again admidst a silence suddenly rent by Frankenstein's cry of triumph as the long, horrid fingers twitch into life. Once the miracle has been wrought Mr. Whale's interest in the affair swiftly evaporates. The monster's reactions to light and fire are good ideas which have been worked out perfunctorily. Nothing is made of the pathetic longing for human sympathy which is an essential part of the original tale, and consequently we look upon the murders as we would upon a series of killings by a wild animal. The only problem posed by the is that of catching the beast. Apparently it is with relief that the producer turns his back on the story and announces a setting reminiscent of the pageantry of White Horse Inn for Frankenstein's wedding. Nor is the monster made the instrument of retribution on the student who had usurped the prerogative of Nature. Frankenstein survives the thing he has created, marries, and lives happily ever after. There was, of course, no need for Mr. Whale to adhere slavishly to Mrs. Shelley's tale, but his version is at all points inferior to the original. Mr. Colin Clive is temperamentally a man of action, not a passionate student of science, but he brings to the part the right quality of tanacity and excitement ; Mr. Boris Karloff is excellently made up as a mechanical man ; and Miss Mae Clark and Mr. Federick Kerr introduce grace and humour into the gruesome story. It was because he wished to dabble in the macabre that James Whale, the director, decided he wanted to make a film of Mary Shelley's "Frankenstein." This picture, which is now at the Mayfair, in New York City, is attracting great crowds in all sections where it is being shown. Mr. Whale read the story in a lonely house on the Hollywood Hills and he admitted afterward that it gave him the creeps. "I chose Frankenstein out of about thirty available stories because it was the strongest meat and gave me a chance to dabble in the macabre," said Mr. Whale the other day. "I thought it would be an amusing thing to try and make what everybody knows to be a physical impossibility into the almost believably for sixty minutes. A director must be pretty bad if he can't get a thrill out of a war, murder, robbery. 'Frankenstein' was a sensational story and had the chance to become a sensational picture. It offered fine pictorial possibilities, had two grand characterizations and dealt with a subject which might go anywhere, and that is part of the fun of making pictures. "I chose Colin Clive for 'Frankenstein' because he has exactly the right kind of tenacity to go through with anything, together with the kind of romantic quality which makes strong men leave civilization to shoot big game. There is a level-headedness about Clive which keeps him in full control of himself even in his craziest moments in the picture. "Boris Karloff's face has always fascinated me, and I made drawings of his head, added sharp, bony ridges where I imagined the skull might have been joined. His physique was weaker than I could wish, but the queer, penetrating personality of his I felt was more important than his shape, which could easily be altered. "I asked for Mae Clarke for Elizabeth because of her intelligence, fervor and sincere belief that 'Frankenstein' would claim the public imagination. Frederick Kerr is an asset to any picture, and I wanted him because he is conventionally well-bred enough not to interfere with the personal liberty of any son over 18 years old. "To make this old tale fresh for the screen, modern intriguing and gruesome details were added to the story in the belief that most of the picturegoers believe what they see (with their very own eyes). "I never intended this picture for children, but would like to make a children's version. It is an adult subject and I tried to make it seem as real as possible. "I consider the creation of the monster to be the high spot of the film, because if the audience did not believe the thing had been really made, they would not be bothered with that it was supposed to do afterward. To build up to this I showed Frankenstein collecting his material bit by bit. He proves to the audience through his conversation with Professor Waldman that he actually did know something about science, especially the ultra-violet ray, from which he was expecting the miracle to happen. He deliberately tells his plan of action. By this time the audience must at least believe that something is going to happen; it might be a disaster, but at least they will settle down to see the show. Frankenstein puts the spectators in their positions, he gives final orders to Fritz, he turns the levers and sends his diabolic machine soaring upward to the roof, into the storm. He is now is a state of feverish excitement calculated to carry both the spectators in the windmill and the spactators in the theatre with him. The lightning flashes. The monster begins to move. Frankenstein merely has to believe what he sees, which is all we ask the audience to do. "Having created the monster, the problem presented itself what to do with the thing. The transition from the slow-thinking, stupid monster into a developed criminal had to be done quickly. He scene showing the monster's reaction to light and fire was an afterthought. "Fritz's cruelty in torturing him begat cruelty in the monster, and the rest was merely devising the type of murders and how to commit them. "The villagers were thrown in for nothing, merely as a background for the bloodhounds, whose yowls form such a delightful background to the pagan sport of a mountain man-hunt. The semi-happy ending was added to remind the audience that it is only a tale that is told, and could easily be twisted any way by the director." Starring Boris Karloff, Colin Clive, Ernest Thesiger, Dwight Frye, Elsa Lancaster. Produced by Carl Laemmle Jnr. Written by John Balderston and William Hurlbut. Directed by James Whale for Universal Pictures, released in 1935. The Frankenstein of Universal City has just finished his biggest job to date and is well advanced on his next assignment of turning men into monsters. This practitioner of occult rites, before whom strong actors tremble, is Jack Pierce, half man, half plasterer. After making two monsters a day (male and female, created he them) over a stretch of thirty-two days for "The Bride of Frankenstein," which James Whale has just finished, he is now filling the hair-restorative companies with consternation by growing hair on the palm of Henry Hull's hand for "The Werewolf of London." Pierce, it may be have been guessed by this time, is make-up expert for Universal, or chief cosmetician, as he refuses to be called. He is now on location with the "Werewolf" company at Vasquez Rocks, California, a weird desert tract of jagged cliffs with look like a geological formation on Mars. There are shaggy Bactrian camels at Vasquez Rocks, fifteen Chinamen in quilted coats and a turbaned Buriat, all members of Director Stuart Walker's troupe, but Pierce is the center of attraction for all the players and staff. A wry, irascible-looking little chap, with black moustache and steel-rimmed spectacles, he looks precisely like a German scientist. Especially is this so when, attired in his white surgeon's tunic worn over a sweater, he is busy doing unprecedented things to the visage of homo sapiens. He thinks nothing of grafting a wolf's head over the bland, celestial features of Warner Oland before breakfast on the desolate location any of these clear mornings. While he looks forward with some ghoullish pleasure to creating some of the more fabulous monsters of his long career during "The Werewolf of London," Pierce supped quite full of horrors for the average taste while engaged on "The Bride of Frankenstein." In this film, a sequel to the original "Frankenstein," he rebuilt Karloff for his role of the monster. Reconstructing Karloff amounted to a minor contracting job. Pierce loaded the long-suffering actor every day with 62 pounds of makeup. Not a little of this was carried on the face. Pierce equipped Karloff with a stucco façade such as he wore in the former picture, but for the present version it had to appear slightly daaged by fire. To get the partially singed effect necessary for the new edition of the monster, Pierce evolved a mangy, frizzled wig that covers only the top of the square skull and reveals the eleven metal clamps that hold the sections of the head together. All the fetching bangs and love-locks of the synthetic man are gone. His face plastered with gray-green grease paint one-sixteenth of an inch thick and an open wound on the right cheek, karloff as the monster looks even more unsociable on the screen than he did before. At his highest point he towers seven feet seven inches above the studio floor. Nine inches of this elevation come from the sole of his boots. They are size 24 and weigh eleven pounds apiece. The monster speaks in "The Bride of Frankenstein" and becomes addicted to a pleasanter vice than his habitual murder and mayhem when he smokes his first cigar. He also falls in love with the monsterette created expressly to that end by Frankenstein Pierce. In making up Elsa Lancaster for this rather ungrateful role, thr Machiavellian cosmetician resorted to an oriental refinement of cruelty. While allowing the English actress's stature to remain below the seven foot line and permitting her to retain her eyelashes and eyebrows, he deprived her of speech while bestowing it on her prospective husband, Karloff. Frankenstein Pierce does not perfrom his experiments in an ancestral castle but in a tiny white-walled cubby hole at Universal City. This, nevertheless, is a more fearsome spot than any gloomy dungeon keep to movie players. It is here that Henry Hull will acquire a wolf's head in addition to his hirsute hands when Stuart Walker brings his Thespians back from the wilds in two weeks. Hull will be a lone werewolf from Vasquez Rocks, and when he falls into Pierce's clutches it will be his night to howl. Another astonishing chapter in the career of the Monster is being presented by Universal on the Roxy's screen. In "The Bride of Frankenstein," Boris Karloff comes again to terrify the children, frighten the women and play a jiggling tune upon masculine spines as the snarling, lumbering, pitiful Thing that a scientist formed from grave-snatched corpses and brought to life with the lightning. So vividly are etched the memories of the Monster's first screen appearance that it seems scarcely possible that the original "Frankenstein" was shown on Broadway in December, 1931. Three and a half years was long to wait to learn whether the Monster died in the blazing tower where the end of "Frankenstein" left him. With this second chapter we know, of course, that he survived. He had, one learns, taken refuge in the tower's water-filled celar and now, in "Bride of Frankenstein," he clambers out, cuffs a few of the remaining villagers into oblivion and stalks once more through the moor, the graveyard and the hills, hated by man, gibbering at fire and--of all things--begging Frankenstein (Colin Clive, once more) to create a mate for him along the same general pattern. In more ways than one, this is a changed Monster. At first, one must recall, he was pretty much of a thorough-going brute, a killer for the killing's sake. Now, possibly under the influence of Spring at Universal, he is slightly moon-struck, hungry for kindness and even--oh, perish the thought--for love. He learns to speak, to smoke cigars and drink wine. "Good," he says gluttonously, and points to the things he wants. "Bad!" he growls and shakes his square and metal-clipped head at fire. One will be amused at his softening, but it will be a respectful amusement; one would dare not laugh: he might snarl. And so, drive by one force and another, poor Frankenstein and the wild-eyed Dr. Pretorious (who has experimented himself and created tiny humans which he keeps in small glass ars) go back into their laboratory, exhume more bodies, obtain a fresh human heart and convert Elsa Lancaster (Mrs. Charles Laughton in private life) into a bride for the Monster. It is rough on Miss Lancaster, but nothing to what happens to the lovelorn, calf-eyed Mr. Karloff. The picture again ends with the apparent demise of the Monster--and his mate--but Mr. Karloff's best make-up should not be permitted to pass from the screen. The Monster should become an institution, like Charlie Chan. Mr. Karloff is so splendid in the role that all one can say is "he is the Monster". Mr. Clive, Valerie Hobson, Elsa Lancaster, O. P. Heggie, Ernest Thesiger, E. E. Clive and Una O'Connor fit snuggly into the human background before which Karloff moves. James Whale, who directed the earlier picture, has done another excellent job; the settings, photography and the make-up (contributed by Universal's expert Jack Pierce) contribute their important elements to a first rate horror film. Last night, largely impelled by your Sunday comments, I witnessed "The Bride of Frankenstein" and must admit I am slightly mystiifed when you say: "Here was tragedy, authentic and mature." At first glance, yes, but on reflection, no. Not authentic because a bride from the charnel house, according to the logical development of the theme, should have evinced a decided affinity for her half-man mate. "Like unto like" should have been the rule here, because, she, too, would have repelled all ordinary mortals. Nor mature (tragedy) because there is no sign of the well-known catharsis present. It is difficult, if not impossible, to extend to a monster that pity, sympathy and comprehension of a gallant losing fight against insuperable odds which we feel for Lear, Hamlet, Oedipus. Finally, and here I think we can agree, why in Heaven's name allow young Frankenstein to go out into the night with his intended bride? Pop goes the entire moral of the tale: the creator to be crushed by the monster of his creation as a punishment for an attempt to emulate God. Again integrity is sacrificed to make a Hollywood hit--in the form of their banal and box-officeish happy ending. In parenthesis: How did they ever let Gypo Nolan die--even so theatrically--instead of having Mrs. McPhillip forgive whole hog, tend his wounds and ship him off to some safe rural retreat with his Katie?